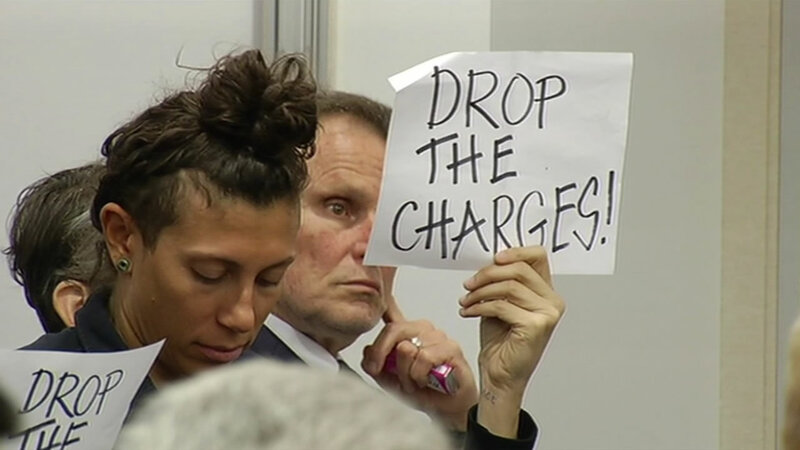 OAKLAND, Calif. (KGO) -- Protesters are demanding that BART drop its prosecution of activists who chained themselves to trains in West Oakland last year. ABC7 News was there as members of the so-called Black Friday 14 and their supporters addressed BART board members. The demonstrators also wanted to draw attention to the Black Lives Matter movement. "We feel we are being unfairly prosecuted as 14 black activists," said Mollie Costello. "We feel we're being targeted in the act of fighting for our freedom and we feel that going to jail losing our freedom is incongruent with what we did which is fighting for our freedom." Last year, on the day after Thanksgiving, the protesters shut down BART service between Oakland and San Francisco for more than an hour. They were charged with trespassing on BART property.